This year is the third year the event known as the World Rocks Against Dementia is taking place, and with some thinking outside of the box, DAI has decided to join the fun, and host an event that is also our first official event fundraiser. About our event: DAI ‘s vision is that all people with dementia are valued and included. We also have a strong philosophy that working together makes us all stronger, and by doing so, we can and will achieve more. Although we have highlighted and promoted the “World Rocks Against Dementia” (WRAD) events in previous years, we have not previously thought of hosting a WRAD event. We don’t have a fully finalised program yet, but please know it will be fun. We have some live performances (yes, via Zoom), and some pre-recorded performances, with time to chat and even ask questions about what is it like living with dementia along the way. From Kate Swaffer suggesting having an online WRAD event, our Board and Action group members then believing is was ‘do-able’ in such a short time frame, awe staryted reaching out to members and musicians. Kate reaching out to Dr Al Power with a random request to be involved, then Al suggesting another jazz musician Dani Greenwood, has definitely started the ball rolling. DAI members are also involved, and one of DAI’s members Graeme Atkins from Queensland, also a musician, has written and performed many songs about dementia, and is opening and closing the event. Yes, it will be live, on zoom! If you are a musician with or without dementia, and wanted to perform live via zoom at the even, we’d love you to join us. To the great credit of the team of organisers of the WRAD2018, Norm MacNamara received personal messages of support from HRH Prince Edward and the UK Prime minister Teresa May to wish everyone good luck and best wishes in what so many people and organisaions are doing in their own WRAD2018 events. Closing performance by Graeme Atkins on guitar, singing ‘Al’s Song’……..as in Al Zheimer! 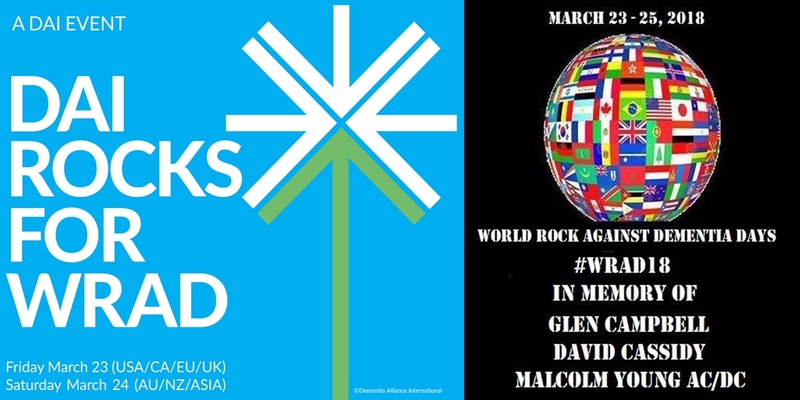 This year is the celebration of the third year of the Annual WRAD “World Rocks Against Dementia” event and we are happy to say it’s looking like its becoming the biggest one ever with 17 counties worldwide over no less than 5 continents. Events on or about the 23rd to 25th March 2018 will be held in memory of those we have lost to dementia, those who are LIVING with this disease and their families and loved ones, and of course, not forgetting those yet to be diagnosed. This all started years ago with the help of Wayne Mesker and the Alive foundation who had already invented RAD, Rock Against Dementia. It’s certainly not a Purple Angel idea! But what Wayne and I did between us, was to create a WORLDWIDE event out of it, which is why it’s now called the WORLD ROCKS AGAINST DEMENTIA (WRAD). We work as a team and involve as many of those who want to be involved. YES !! Its true its never really attracted mainstream TV or media but the beauty of it is, it doesn’t have to because this is an event BY THE PEOPLE, FOR THE PEOPLE and every year it gets bigger and bigger and every year it will touch MILLIONS across the globe which proves we don’t need big celebrity names to do something like this, it’s a grassroots event supported by some huge dementia organisations like Alzheimer’s Disease international, Dementia Alliance International, Dementia UK and others. The event runs for up to 1.5 hours. Getting in the mood for WRAD2019! Dementia Alliance International © 2017 All Rights Reserved. Subject to the Copyright Act 1968, no part of this online website may be reproduced, stored in a retrieval system, or transmiPed in any form, or by any means, electronic, mechanical, photocopying, printed, recording or otherwise, without the prior wriPen permission of the authors.